I am not sure how this photo was used or if it is part of a brochure on the band, but it looks like a promotional piece to me. 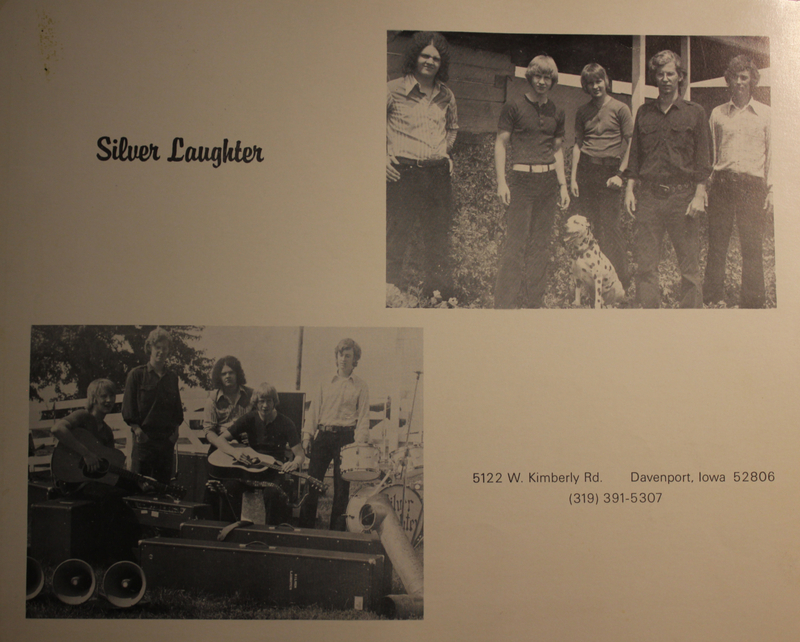 In the top photo from left to right are: Steve Elliott, Kim Ludtke, Jon Ludtke, Denny Walton and John Carstensen with dog, Lucky, down below. He did not play an instrument as far as I know. In the lower picture from left to right we have: Jon, Denny, Steve, Kim and John out in the yard with all their equipment. It looks like Kim is already branching out from his drumming duties. Silver Laughter band members do not look all that enthusiastic, probably because after the session they will have to tote all that stuff back into the house or rehearsal studio!